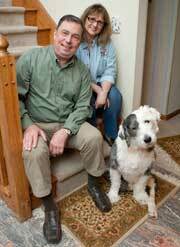 "When you see results and you know you've helped them to live a better life, or helped to extend the life of an older dog and given their family one more good year with them, it's great.... it's incredibly rewarding," says Dr. Corey. 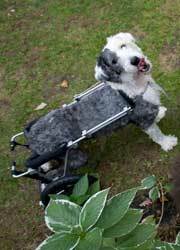 Donnie, an Old English Sheepdog, was paralyzed in his rear legs after suffering an embolism when he was barely more than a puppy. Now, just over a year later, Donnie gets around just fine with a modified wheelchair and his mobility and comfort have increased dramatically. Donnie's "mom," Jane Ogg of Glendale, RI, credits that to the treatments he receives at Healing Paws and the daily care he receives there while she's at work. "They're just fantastic," says Ogg of the staff at Healing Paws. "I can't say enough about them and Donnie loves them too – he can't wait to go see them every morning!" she says, laughing. "It's all about the dogs with Dr. Jeff. [At Healing Paws] I know they're good to him; they're very devoted, very compassionate. The fact is, it's the only place of its kind around here, but even if it wasn't, that's still where I'd take Donnie. They go out of their way to do all they can, like taking care of him for me while I'm at work. And Donnie is a lot of work, but he doesn't know any different. The back of him may be paralyzed, but the rest is like any other young, happy dog. How could I not give him a second chance?" 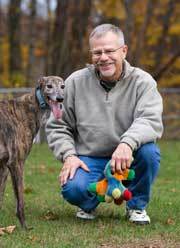 John Christopher of Rehoboth, MA brought his four-year old Greyhound Nikki to the Center after she had surgery for a hematoma on her spine. Though she was basically unable to move around on her own following the surgery, after several months of treatment Nikki is now able to run, jump and play with John once again. You can hear Nikki's story from John first-hand, in the video posted on our homepage. Allie's leg broke after she fell backwards off of a couch while playing with her sister, Riley, on August 21, 2009. I was devastated by the complete break of her radius and ulna, which left her leg dangling in a horrifying way. After she had a plate inserted by an orthopedic surgeon, I began to wonder what I could do to ensure a complete recovery for her. Fortunately, a neighbor had dealt with Dr. Corey at Healing Paws and I was given a glowing recommendation. I contacted Dr. Corey and he assessed Allie as soon as she was out of her surgical bandages. 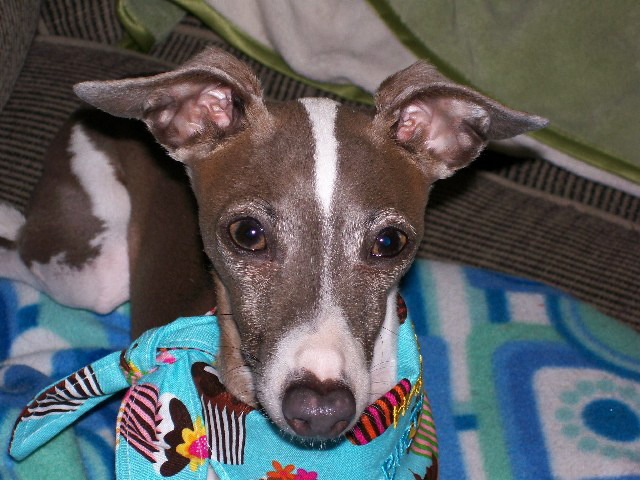 I cannot say enough about the positive experiences that Allie and I had throughout her treatment at Healing Paws. I can't say enough about Healing Paws and the staff but I can tell you the story of how they helped my family and our Miniature Daschund, Ellie. Ellie hurt her back, as she has done a few times before, but this time I noticed that she seemed to be weak in her hind quarters. I brought her to the ER to be examined by the emergency vets and they decided to keep her overnight for pain management to closely monitor and confine her. She took a turn for the worse and ended up having to have emergency back surgery (Sunday). She was completely paralyzed in the hind quarters and with only deep pain response going into the surgery, we hoped for the best. I met Dr. Jeff on Tuesday when visiting Ellie after surgery. He spoke to me about what they offer at Healing Paws and how they thought they could help her in her recovery and help promote her healing. He spoke about acupuncture, massage, ROM (range of motion exercises), laser treatments, water treadmill, along with other exercises. Treatments at Healing Paws made all the difference for not just one, but two of Patricia Bentley's furry family members, adding years to Abby the Daschund's life and providing a complete injury recovery for her other Daschund, Joanie Baloney.